Hopefully, the student who wrote the article will rethink many aspects of it and hopefully she does not suffer major repercussions from writing this misguided piece. And though she originally seemed to be defending the article she eventually at least posted an apology to Sam. I want to apologize for singling you out in my essay Samantha. I am sorry for any grief this has caused you or may cause you in the future. However, there is one part of the story that I believe is in need of a major, detailed examination. And that is the role of Science Magazine in all of this. I went on a bit of a rant about this on Twitter when I and other people found that Science's response to the controversy was insufficient. I embed my posts about that below. But this response seems, well, drastically insufficient. For example, @sciencemagazine are you going to review the article itself? Is it being edited? Retracted? Anything? So I started to dig around into what I could do and then I got an email from the Editor in Chief of Science. Apparently, after publishing an article that directly critiqued a PhD student in public in his own magazine he was uncomfortable with responding in social media. I am not sure whether Jeremey Berg thinks these emails should remain private but I do not think that. So I am posting my exchange here. Editor's note, 17 March, 12:45 p.m.: In setting the context in this opinion piece, an individual (Science Sam) was identified and many have read the article as a personal attack. This was not the intent of the author or the editors, and we apologize. We are examining our editorial process for these pieces moving forward. This is an honest assessment of what happened. The author’s concerns about what she perceived as an expectation for her, as a woman, to participate in a certain type of science communication was driven by promotion of this on her campus. In retrospect, the piece should have been edited so that the person was not identified, but it was not intended to be an attack and was not read this way by several editors and many other readers. What do you think will be accomplished from “a more thorough investigation”? 1. The author said on Twitter she worked extensively with an editor to craft her piece. I think it is important to know if it was ever discussed that she identified a specific person for her critique and whether they considered that to be a good or a bad thing. For that matter, how was this introduced to the piece - did it come from the author or from the editor? 2. Does Science Magazine have any policy of any kind regarding personal attacks / critiques like this? If yes, were they ever considered in this case? If no, why not? 3. During the editing process, was there ever a discussion of how to get more attention to the piece? I can only assume yes so in that context what was discussed? Did the mocking, demeaning wording come from the editor or from the author and why was it not removed? For example consider "Publicly documenting the cute outfit I wear and the sweet smile I brandish." Given that the article publicly identifies the target of this piece, it is reasonable to assume this is targeting Sam. This is just not OK.
And furthermore, who chose to highlight that one line in the piece. Yes, it is catchy. But it is a personal attack against a female graduate student. And it is astonishing that it was published. 4. Why was it deemed reasonable for such a piece to repeatedly disparage outreach efforts of others? Is this a useful thing to publish in this space? ".. I am annoyed that the majority of the posts seem to celebrate a very narrow representation of femininity,"
"demonstrate that they're interested in clothes and makeup, that they're physically active, and that they are attractive romantic partners"
" Time spent on Instagram is time away from research"
I believe there is no way to interpret this other than an attempt to shame people like Sam. This basically is saying "you cannot do this - you are to be shamed for focusing on such things". 5. Are you and Science going to publicly apologize to Sam? 6. Why does this piece not suggest alternative uses of Intagram? Why is it just attacking what other people do? And much more. I think this article, being published in Science, with the editing help of Science, is in need of a thorough investigation to find out why it ended up the way it did. Why was there a personal attack left in? Why was it deemed OK to mock other people? Why could it not instead have focused on positive suggestions for how to do outreach in other ways that maybe Meghan was OK with? And so on. I encourage you to have a more public, open discussion of how this happened and how you might try to prevent it from happening again. Hi Jonathan: Thanks for your response. The story unfolded as described in the piece. 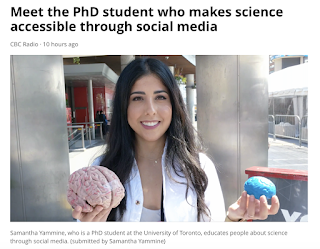 The author was introduced to Science Sam’s Instagram efforts at a career workshop, started looking into this and other Instagram accounts, found herself uncomfortable with the content and her perceived expectation that she follow suit, and did some self-reflection to conclude that she resented the implications regarding the underlying issues related to women in science. Based on this, the author wrote her essay and submitted it to Science Careers. Her experience with Science Sam’s Instagram account was always a central part of the essay. The editing process involved working with her on the writing to help make her message clearer. There was no attempt to get more attention to the piece or to make it more inflammatory. I think the perspective that some young female scientists feel pressured to participate in science communication efforts, particularly those of a specific type, is an interesting one. I do not read this as an attempt to disparage the efforts of others but rather to explore the basis for the author’s reactions to these efforts. We have both publicly and privately apologized to Samantha. As I said in my earlier email, in retrospect, we should have explored ways to avoid naming an individual specifically in the essay, both to avoid the appearance of an attack and the loss of the message of the essay over this issue. As we indicated in the Editor’s note, we are examining our processes related to these pieces. It did not, well, make me feel like Science was going to be doing anything. And many parts of the response I find troubling. But I could not deal with all of that. I focused on what they planned to do in terms of looking into what happened and wrote back. I have many questions and comments and concerns about your response here but want to focus on one issue. What do you mean by "we are examining our processes related to these pieces." Can you say more about your plans in this regard? Hi Jonathan: At this point, there is not much more to say. The people involved in the process will meet and discuss whether we need to do anything differently to avoid potential problems in the future. So - basically, it looks like Science Magazine will do nothing. They published an inappropriate article targeting a single PhD student and that article was also loaded with a variety of sexist misguided attacks on specific types of science communication. And they won't discuss this on Twitter because it is not the right place to discuss it. And then by email they basically state "We will privately look into it and not tell anyone." That is just not enough. I plan to pursue this further via AAAS and see if a formal, perhaps outside review can take place. Thanks Jonathan. As you know from our emails, I have had a similar email conversation with Jeremey Berg with a similar outcome. This is a great summary of a very unfortunate decision by Science's editors, and as a AAAS Fellow I am disappointed.